There is a cymbal for sale that I’m interested in, and although the stamp indicates an 80’s 2002, I don’t think it looks like a 2002. All the logos are gone, so could this be a Jazz series wild 22” ride? I’m looking for a Paiste 2002 22” ride, but I’m not sure this is it. Could the stamp be a fake? The owner says it’s a red label but how could you tell? Looks like a 2nd-gen Sound Formula, but I am definitely no expert. 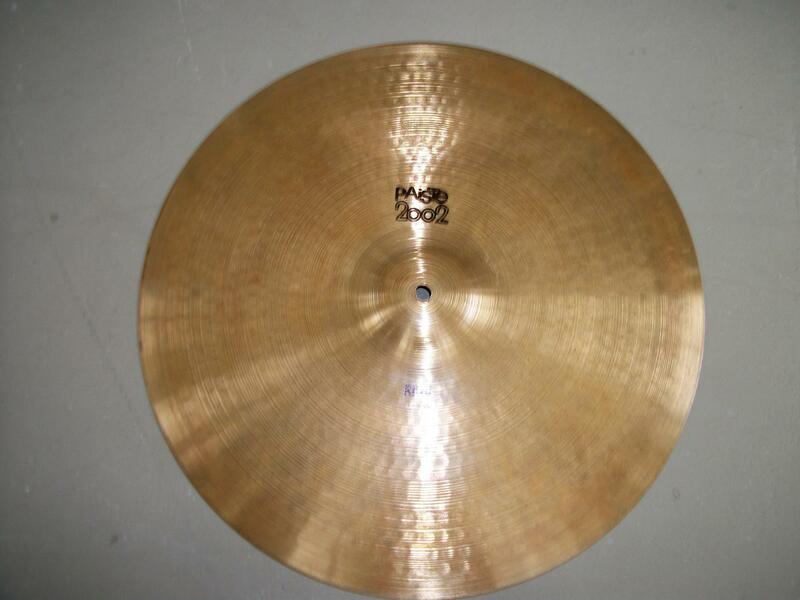 I have a 1979 Paiste 2002 18" flat ride I bought new, and besides the lack of a bell, it looks nothing like this. Just FYI, as I have no idea what came after. 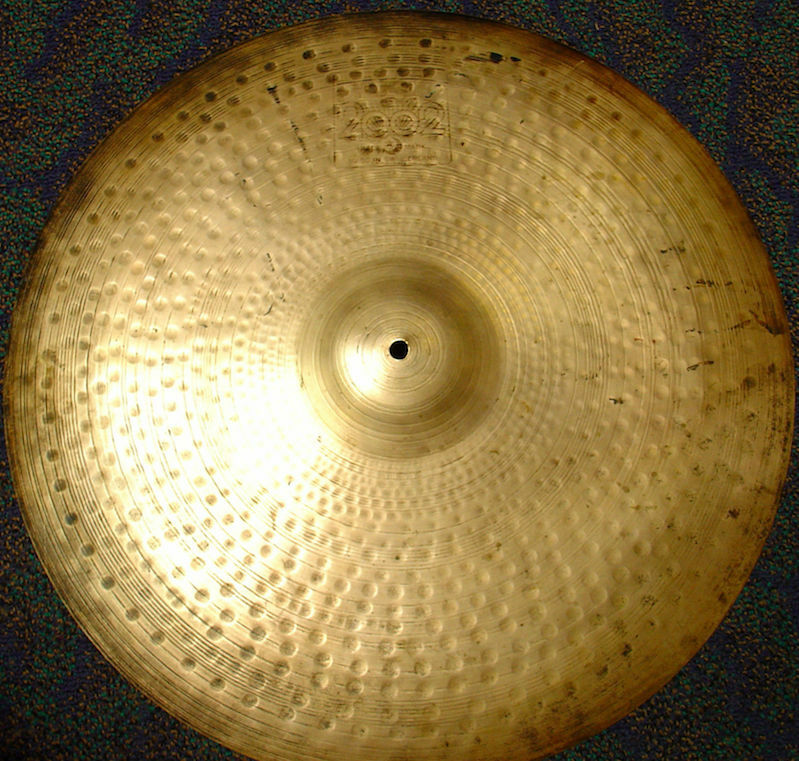 It's a 1986 cymbal from the Pasite 2002 line. That is in the Red label era. As to which model, I'm not sure. During the years 1981-1986 Paiste helped us out by writing the Series name in as part of the serial number. Do you have something really specific about the style of the hammering or lathing or bell shape which makes you doubt the serial number? It seems within the natural range of variation to me. Here's a 1978 Black Label 2002 RIDE with the ink still on it. It is 20" and weighs 2330g. And here is another example I've got in my files showing the hammering style on a 2002. This one is 22" and weighs 3700g, but no model ink. Do you know the weight of that 22" you are considering? That might help pin down the model in the absence of model ink. I've got the weight tables from the lost (but we're working on resurrecting it) Pasite-Only Wiki which also acts as a list of models available. I'm not sure if all the 2002 stuff is back yet but it is getting there thanks to a dedicated team of researchers. My specialty is the 602s, Sound Creations, and Trads although I have a pretty good working knowledge of the rest. Thank you so much for your detailed reply. The seller told me it’s 3617g and that it’s heavy. It’s interesting that your second photo is very similar to the one I posted. Looks to have the same unique hammering. But this model doesn’t seem to have the hammering style of the one I’m looking to buy, yet the seller says it’s the same model, just vintage. He also said it’s made in Switzerland. He wants $210 for it, and the seller of the newer 2002 that I just posted wants $300 and it looks to be near mint, just not vintage. Since the seller is not the original owner, how can he be sure it’s a red label and not black label? Is there something about the serial number that gives that away? Thank you! I guess the reflection really makes a difference on how pronounced the hammering comes across. I just always wanted a classic 2002 22” ride, love the way they sound. I’m going to hear both today, but for an extra $90 I might as well go with the newer cymbal that has all the logos. Then again there is something to be said about vintage cymbals that have aged, they aren’t as bright. I don’t know what the cymbal is you posted exactly but I do know I’d buy it. Now I’m thinking due to the weight of 3617g perhaps it’s a black label 2002? As I hear they were about 500g lighter than the red label ones. Are the BL well regarded? That weight make me doubt it's a 2002 Ride. Just intuitively it seems too heavy. Perhaps it's a Deep Full Ride? Just guessing. What is the weight of the regular 22” 2002 ride? It’s definitely a 2002 as per the stamp in my photo, but yes I would agree it’s hard to determine the model. It could be a heavy ride or Power ride. Steve probably has the weight ranges. Based on experience I would expect a 2002 Ride to be about 3000-3200 grams. 3600 seems off the charts if it's supposed to be a "Ride" model. ... And here you go... See the weight of this model? Should hover right around there (3170g). Yes at 3617 g it is definitely a Power or Heavy Ride. That is heavy weight in a 22" B8 alloy cymbal. Probably great in a loud rock band. Looks like a nice cymbal. No reason to assume the seller isn't right that it's a red label, the labels were red in '86. For me, the price makes a difference. All things being equal, no way am I spending $90 on some ink stamps. However, the newer cymbal likely has a different weight. My tendency is to look at BOTH cymbals with equal skepticism until you hear each, preferably side-by-side. To address your original inquiry about originality, there's zero reason to assume it isn't a 2002 cymbal. If you could find an '86 Paiste catalog you might be able to narrow the model down by looking at which 2002 22" models were offered that year. As far as sound goes, though, the labels don't do much. I agree label's don't matter much, but 400 extra grams will. I don't think it's a "Ride" model. But even if I'm wrong about that I'm certain that I would not want one 400 grams on the heavy side. Price won't help with that if it's too heavy. Thanks everyone! I spoke with the seller and decided to pass as it’s much to heavy for what I’m looking for. I already have a 1991 Alpha 22” heavy ride, so I really want the regular 2002 ride. I’ve contacted the other seller and will go tomorrow to hear the one he has which is a regular 2002 22” ride. Alas the wiki weights are summaries which left out which production era, and give no indication of samples size and how much variability there is. We're working on getting that sort of information but it is a long road. Based on this summary, once you get into the 3600g zone you are looking at Rock Bell Ride and Power Bell Ride and perhaps the Power Ride depending on where the top of the weight range is for those. Do you mind passing the seller information on to me through PM, I like heavy rides.